I_Love_Storms wrote: LI -7, how often does this happen down here? Okay thats it.. i am getting excited, i have a good feeling about this one! Just found info for 3rd December 2007 when some extreme storms hit Melbourne. 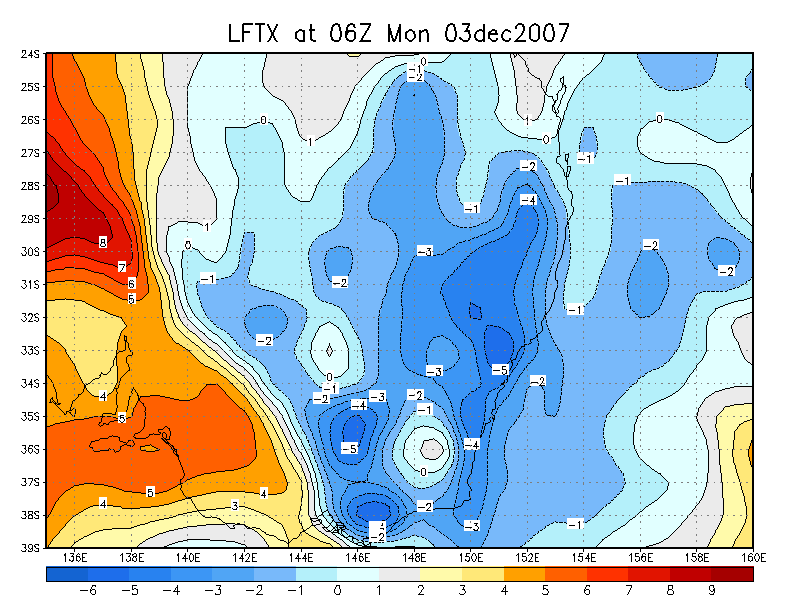 LI values were max -6 to -7 at 06z...by the looks of the chart anything past -7 is off the charts!!! The latest GFS (06z) is now going for 50-100mm widespread on and south of the ranges between Thursday and Cup day. This is from the Brisbane storm chasers site so only has instability and rainfall charted. At around 10pm the other sites that host GFS information should have the synoptic pattern as well. LIs on Friday are now as high as -9 in that hot spot around Maryborough I mentioned earlier and CAPE over 3000. Later in the afternoon and into evening -7 LIs spread right over Melbourne and in fact huge areas of VIC have massive instability progged especially through central areas Again I'll have to stress that this could well be a bit over the top (or more than just a bit ) If anything the heat has probably been upgraded for LIs and CAPE to upgrade unless the humidity has upgraded. Anyway that is not even the main event IMO. Even more worthy of getting excited about is a major rain event that GFS now has for the Sunday/Monday period. This is where the bulk of the rain will come from for mainly western and central parts but including all of Melbourne and west Gippsland. I can only imagine that the low NOGAPS and EC had in the evening run is now appearing on GFS. It's looking anything but boring and dry now I can tell you. This is a real 'tropical incursion' that we can get sometimes in summer with the odd huge rain event at times but the difference is we're only just past mid spring. Beautiful summation Andrew. when I opened the 06z GFS I almost fell off my bean bag . As you mentioned, we have seen GFS pump events up before, but geez it is looking mighty tasty!! Spot on Andrew alot of that rain that GFS now has tonight has to do with the late Sunday/Monday system, GFS looks exactly like NOGAPS now and close to EC I guess but the other 2 models don't have those ridicolous totals thats 06z GFS has but NOGAPS still has 30-40mm in parts of the South. Gees in saying that though I just looked at the 96 hours total and has massive totals in Gippsland so alot of that rain progged there is actually from the Thursday to Saturday storms outbreak and GFS in general has been progging some big totals that way for quite few runs now. The heavier rain progged over SW Victoria and West Central district is more to do with the Monday system. Wow we are all getting pumped about this system it is looking very interesting. With the storm forecast you can have large Lis Cape etc but if there is no major forcing with a strong surface and upper trough cold upper air height falls from approaching front trough then all this great warm humid air will do nothing and we will get a hot humid day with few clouds and shower and rumble nothing major. I really cant see it been as great as models are showing. I think Dps will be nice but nothing higher than maybe 15c but down here that is still good and temps in the upper 20s here looking low to mid 30s in the North. It will be messy Thurs- Sun but cant see anything major, Troughs aren't that strong at all, forcing looks moderate at best the 500 250hpa level is pretty cold this time of year, but bit colder be nice at this stage any way. Quite cloudy this morning with increasing DPs. Looks rather sticky and unsettled tomorrow through to cup day with moderate totals about. US has relaxed somewhat but may ramp it up further. Should see 10-30mm out of the sequence. The next few days have hardly changed in the models. Increasing temperatures and humidity with the best days for storms Thur/Fri/Sat. There is also the outside chance of a shower today. Sunday into Monday initially looks OK, but the low then gets dragged south (in th EC/JMA scenario) and we get a burst of dry heat ahead of the front. Could easily see a low 30s on Monday out of that with a dramatic change in air mass. NOGAPS/GFS/GASP have a more northerly track on the low and the consequently a lot more rain/storms on Monday/Tuesday (fingers crossed this comes off). Then goes cool and showery for Tuesday in the south. Being storms totals are tricky. Could see 50mm in places, while others may scrape only 5mm. The winds with this system are rather unusual for a storm outbreak - decent off shore flow for 3 days (around 20 knot NW at 850) so sea breezes shouldn't be a factor, and things should readily move off the ranges. Still a lot of uncertainty for Mon/Tues. We need this to deliver as things are drying out quickly. The air smells moist!! I think with cloud clearing already we should see convection develop right across the divide. If we can get Monday and Tuesday going, it will be cup weekend 1995 all over again. Morning all, sunny morning here but cannot say it is humid for the short time I was out there. Maybe a little more than usual but not muggy at all. Haven't even looked at models for this one as been too busy for that. What is progged for up here? I rarely post, but keep a constant eye on this site. Is there anyone that can tell me if there are any courses that i can do to increase my knowledge on all aspects of weather and in particular reading the models? Whilst i have always been interested in the weather and been a storm spotter for the BOM before, i would love to expand my knowledge so i know what you guys are talking about more. From all reports the next few days sound quite interesting. Looking forward to the updates from all you guys as this system develops. Hey Sam! While I don't know of any courses apart from full on meteorology, reading forums like this and asking questions really helped me along. I am not nearly as up to speed as others on here are but I can get a fairly good idea of what they are saying through just keeping an eye on on them(though not relying JUST on them) and asking some questions to others about them. Also searching the internet for information on weather models and reading charts is pretty good too. Google is your friend! Keep at it mate and you will find youself talking about potential upper lows and cold outbreaks with the best of them! As for being a spotter.... no idea! Got some minor to moderate convection to the south here. Another glorious day here and will be good for working nightshift tonight which means I better go back to bed! I agree, people like John and jake have helped me alot in understanding some of the stuff people say, but I am still WAY off knowing as much as they do!!! Today's cloud took me by surprise, I thought the morning cloud would appear, but didnt realise there would be higher cloud as well. After days like today I am always sceptical(is that a word???) about heat forming, but then looking at Adelaide and places north of us today, all we need is that northerly wind to bring the heat down. I am still going to say only 23-25 tomorrow, especially if a seabreeze kicks in. Also will definately be a day where the inland subs will be much warmer than the bayside ones. Even Ballarat will be warmer than Melbourne tomorrow I say! Still looking very unstable, particularly Friday. GFS has come to it's senses (although the same can't be said for LAPS) and downgraded the whole sequence. Still with the humidity and instability around there should be heaps of showers and storms. Interestingly the storms look like hanging around well into the evening and even overnight, particularly Friday night so a long window of opportunity. It's going to be very frustrating trapped at work whilst my area looks like a hot spot for instability from models and has been for some time. Saturday and Sunday still a bit of a chance for more storms but Monday looks really dodgy now. It's a real touch and go prospect whether we get a good rain event or just a few showers. I think I will take this system a couple days at a time... a lot of jumpy models atm, particularly from Saturday. GFS still really struggling with Mon/tues, whereas EC has been onto the change with NOGAPS from the start delivering a decent change without anything over the top. Funny this morning GFS went ballistic and came on board and then jumped off again.. Anyway next 4 days will be humid and unsettled, all models agree with that..
Further to this Laps and even Meso Laps is on some serious drugs tonight..has Dps of 20 for much of Western Vic on friday, and culminates with 50mm for Saturday thru central and Eastern areas...not out of the question but such a broad area of rainfall is unlikely.. Very dynamic looking sky already this morning! Plenty of (low-ish) Accas around and even Tcu already to the north! I've been working the night shift and been watching this all develop ever since the sun started to come up. The sky looks very unstable and very promising for later on this afternoon! Bring it on! Looking very unstable atmosphere, dynamically unstable with as you say the cloud signature indicating this. Showers from 3pm and local thunderstorms from 4pm easing later. Local falls of 25mm possible.